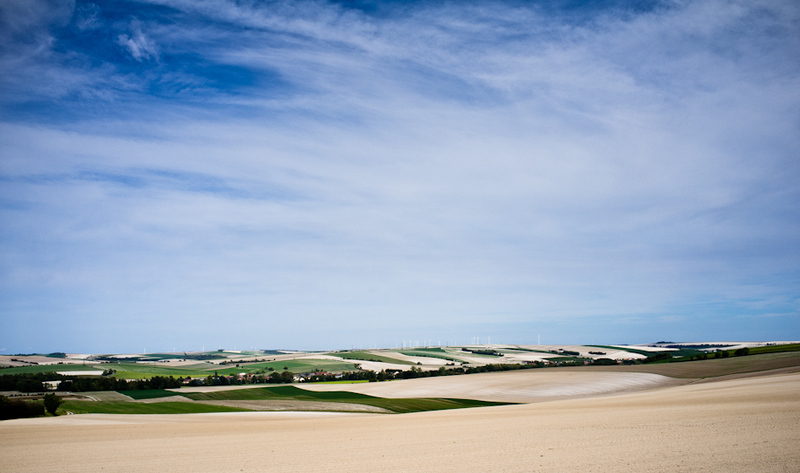 Leading with a photo this time, this was taken on the way to Reims when I pulled over to get out of the wind for a minute. I will admit to the two nights in Reims being somewhat of a backup plan, the original plan was to stay a night or two in the nearby town of Épernay and spend much of the time rolling between champagne houses. 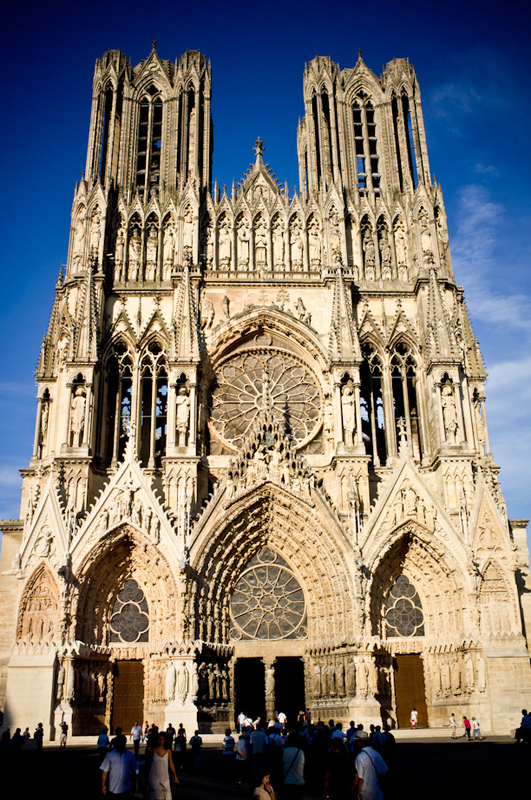 Having looked at the prices of hotels in the area (and picking my jaw up off the floor), Reims became the new plan A. By now the full on ‘not doing anything because I’m on holiday damn it’ mode was in full swing and as such, the photography took a back seat. 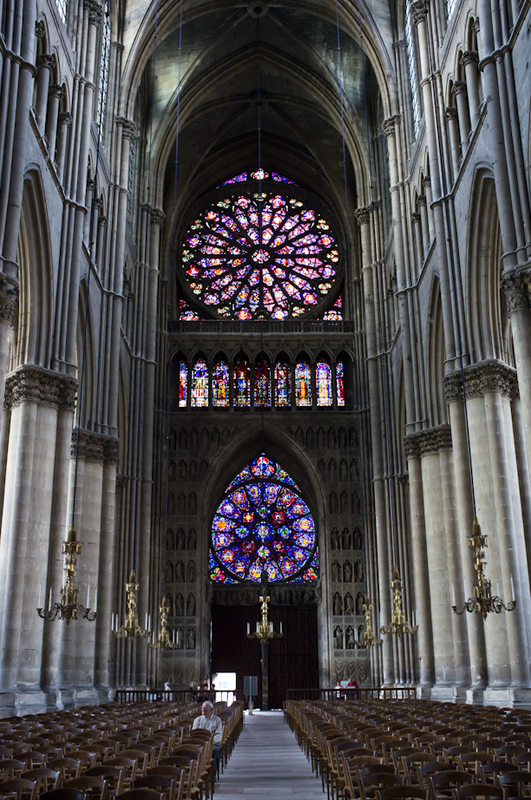 In fact I should probably just name this post ‘Day 7; Reims Cathedral’ because that’s pretty much all we did on our first day in Reims. We walked around the city, ate, drank and generally didn’t do that would make a very interesting blog post. The hotel was only a few minutes walk from the cathedral, in an out of the way, middle of a residential area kind of place. It was only a few minutes off the motorway and through a very straightforward series of junctions and sat nav directions. Chosen for it’s safe underground parking, the proximity to the cathedral and the city center was a nice surprise. So as you may have assumed already, we discovered the cathedral. It was nice to get inside the cavernous, cool building on a day that must have been in the low to mid 30’s temperature wise. Definitely one of the hottest and most extreme sun days we’d experienced during the holiday. So the stitching on the vertical panorama above may not be perfect but it gives some sense of the scale of the building. Just ignore the sheared stone column and the half a tourist propelling himself along without any legs. I had considered asking everyone in front of me to stay perfectly still for 20 seconds but I wasn’t sure how well that would be received. 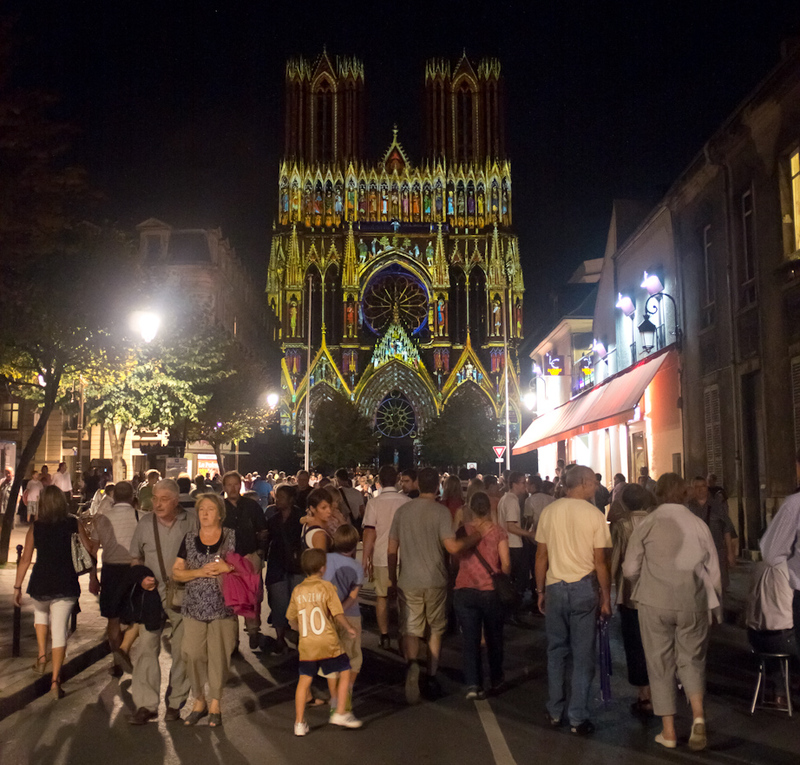 After our first experience of Reims in the Cathedral, we wandered aimlessly into what appeared to be the city center and ate a wonderful al fresco dinner in what appeared to be the busiest bar/restaurant in the city. Some more wandering to work off the full stomachs turned into a general meander in the direction of the hotel as the night drew in rapidly around us. Something we hadn’t expected, when crossing Rue Libergier, was to see swarms of people heading in the direction of the cathedral. Curiosity drew us in their direction and it was immediately apparent what the attraction was. If I’d thought about it some more, instead of concentrating on the show in front of me, I’d have actually got the settings on the camera right. Maybe I would have even managed to shoot some vide. 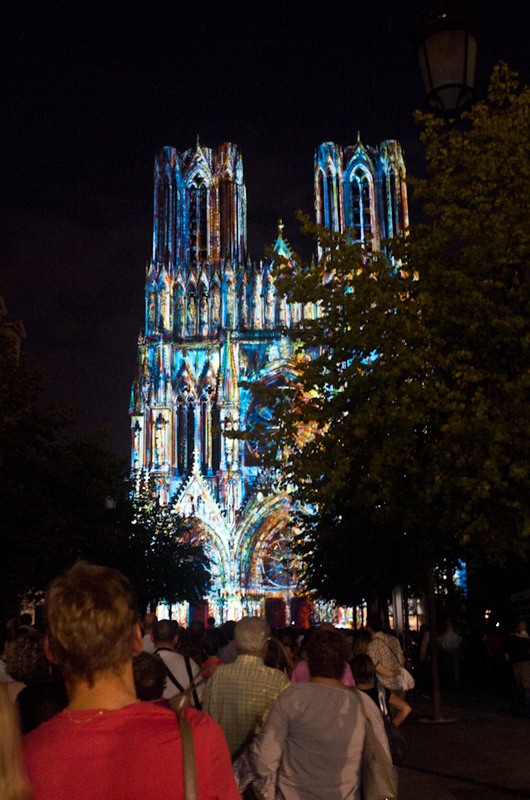 Several high powered projectors lit up the front of the cathedral and performed a very impressive light show set to music. I remembered seeing this effect on other buildings around the world but up to now had only ever witnessed it on youtube or elsewhere on the internet. Speaking of which, you can watch the entire nearly half hour light show thanks to some intrepid youtuber here as long as you can handle the hand held shaky camera thing. Best to watch in 1080p in full screen if your broadband and/or computer will allow you. This youtube user has just a snippet of the show but managed to get to the front of the crowd with a tripod. It was amazing. With the smug sense of feeling like we’d accomplished something of cultural value (or at least I did), we headed back to the hotel to snack on the sweet stuff we’d bought in Riquewihr before departing. before is start reading… that first photo is just top class. 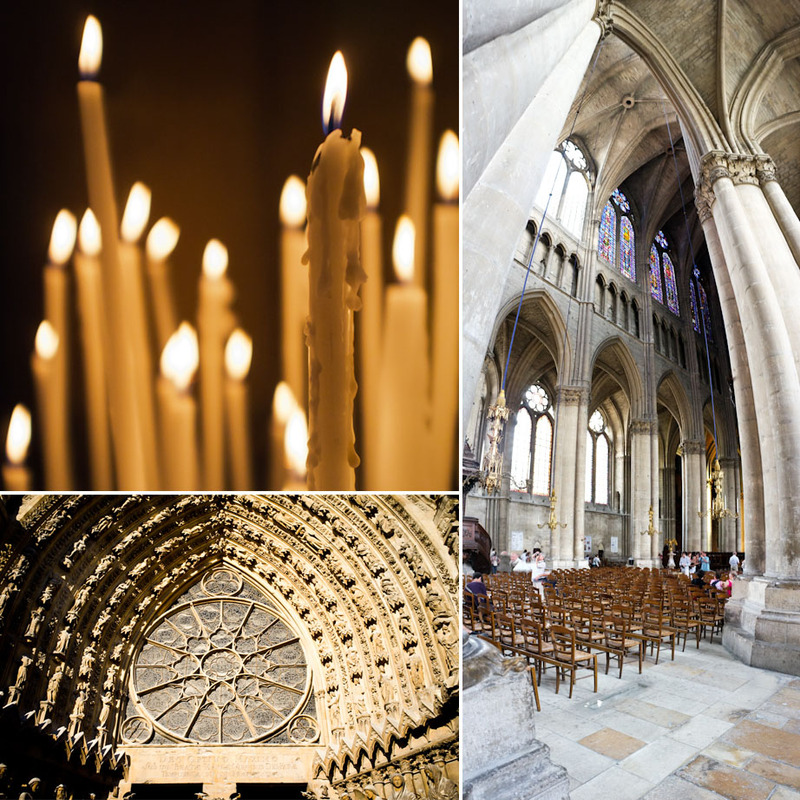 when scrolling down to comment box it seemed just right all arches, spires and towers pointed in the right direction. ok, that’s it, i’ll read now.